Welcome to the Family Vision Development Center in Aurora, IL. Please feel free to browse our website. We are a full service vision center offering comprehensive vision exams for eyeglasses, contact lenses and management of ocular disease including glaucoma, diabetes, macular degeneration and cataracts. Dr. David Martin and the Family Vision Development Center team endeavor to provide you with the best in optometric, vision therapy and rehabilitation services. We accept both eye emergencies as well as scheduled appointments. The Family Vision Development Center is dedicated to keeping our patients comfortable and well-informed. Dr. Martin will explain every exam and procedure and answer all of your questions. Additionally, at the Family Vision Development Center we offer financing options and will work with vision insurance providers to ensure good eye health and vision care for all of our patients. Our specialty is neuro-optometric rehabilitation and vision therapy services. We treat binocular (two-eyed) vision disorders such as convergence insufficiency, focusing (accommodative) dysfunctions, strabismus (exotropia, esotropia) and amblyopia (lazy eye). We also provide vision rehabilitation services for Post-Concussive Vision Syndrome and vision problems related to traumatic and acquired brain injury such as strokes. We will provide you with the most comprehensive neuro-optometric vision evaluation and will create individualized treatment programs using the most current and effective equipment and methods. There are many resources and links on the website to educate you about the types of binocular vision dysfunctions we treat. We have also included printable pre-exam questionnaires for you to fill out to expedite your visit to our office. We know your time is precious so we offer convenient online scheduling 24/7. 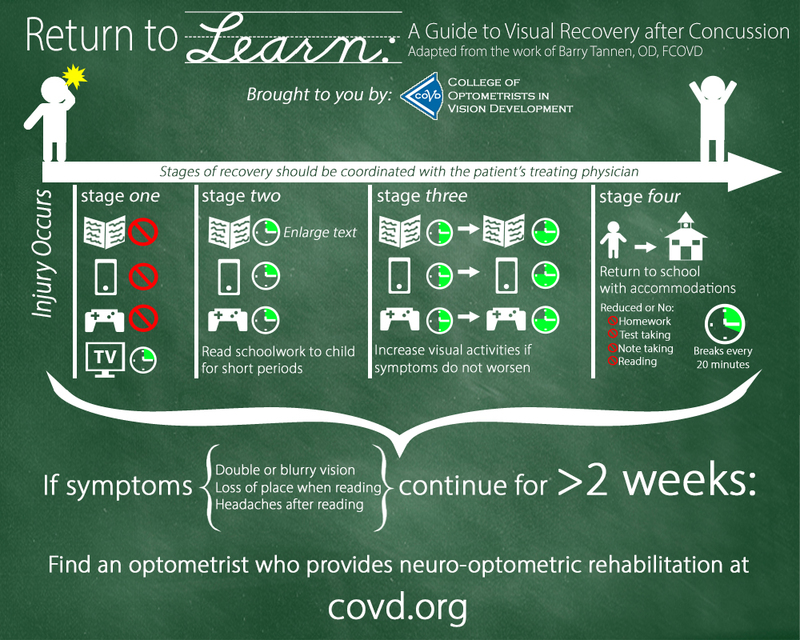 August is the 20th annual observation of National Children’s Vision & Learning Month and a perfect time to shed light on the vision problems associated with concussions that impact academic performance. Shelby Hedges’ concussion occurred during the first soccer game of the high school season. Prior to her concussion Shelby was an avid reader, but afterwards, she had trouble with reading and focusing as soon as she started trying to do her schoolwork. After about 1 month it was obvious her difficulties were not improving. A trip to her concussion specialist resulted in a referral to a developmental optometrist who helped Shelby return to her normal life as it was before the concussion. Kelsey Ransom wasn’t as fortunate as Shelby. Reading was already a struggle for Kelsey and after she received her second concussion playing basketball the change in her academic performance was not as obvious as when she received her first concussion. She had been diagnosed with a Non-Verbal Learning Disorder prior to this concussion and the psychologist had told her mother that her I.Q. was “off the charts,” so her mother thought that Kelsey was just “lacking focus” and she was just experiencing normal “kid” issues when her struggles got worse. In addition, Kelsey shared that one of her teachers would actually chastise her for not paying attention because she was writing and not paying attention to what he was saying; when in fact, she was still trying to copy information from the board before he would erase it. Once she understood her difficulties were due to a vision problem , she was able to explain the situation to her teacher. The majority of vision screenings performed in schools and pediatricians’ offices are not designed to test for eye coordination, eye tracking, or eye focusing problems. In fact vision screenings miss at least 50% of vision problems. In addition, general eye exams often do not thoroughly evaluate all the visual skills required for academic success . The diagnosis and treatment of convergence insufficiency is a specialty field within optometry performed by developmental optometrists. A cross-sectional study was performed of adolescents (ages 11 to 17 years) from the Concussion Care for Kids: Minds Matter program at Children’s Hospital of Philadelphia with co-investigators from the Pennsylvania College of Optometry at Salus University, Michael Gallaway, OD, FCOVD, FAAO and Mitchell M. Scheiman, OD, FCOVD. Sixty-nine percent of one hundred children examined were found to have one or more vision problems. In a recent study published in the June 2015 issue of the journal of the American Academy of Pediatrics, Academic Effects of Concussion in Children and Adolescents, it was found that those with higher severities of concussion experienced extended recovery time from symptoms that can interfere with academic performance. These post-concussion symptoms include problems with concentration, eyestrain, loss of place while reading, slower processing speed, headaches and fatigue. These symptoms are very similar to symptoms relating to binocular vision disorders. We believe in a one-on-one approach to optometry. At the Family Vision Development Center, we are dedicated to providing high-quality optometry services in a comfortable environment. Call us at 630-862- 2020 or schedule an appointment online today. For a complete list of services, visit our services page or call 630-862-2020. Dr. Martin received his undergraduate degree from Northern Michigan University. Dr. Martin then continued his optometric training and graduated from the Illinois College of Optometry in 2005. He then received additional training in Vision Therapy and Vision Development at the Kansas Vision Development Center, the largest vision development center in the state of Kansas. He has one young daughter. "Dr. Martin is extremely thorough, knowledgeable, and takes great care of us. I highly recommend him to anyone needing eye care-- even if you don't have the quirky kinds of eye problems we do!"